Recently I had the opportunity to do a little bit of purchasing so I finally purchased some items from Charlotte Tilbury. I have been wanting to for ages. I purchased the Goddess Skin Clay Mask, I had heard so many good things about it and I needed to know if it lived up to the hype,. It does. It so does. 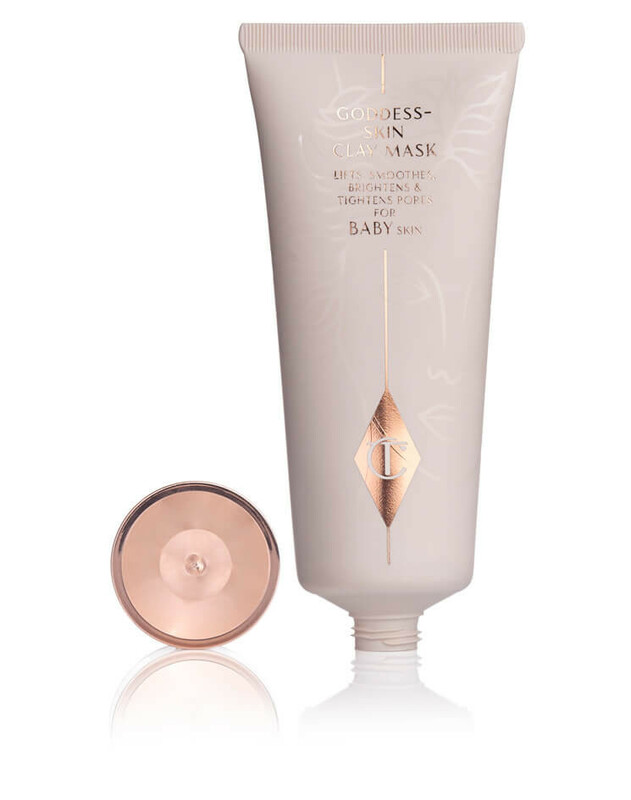 This mask is a non-drying clay mask that leaves skin looking dewy and glowing. It features ingredients to help create the appearance of smaller pores, hydrated and more moisturized skin, fewer imperfections and glowing, dewy complexion. 85% of users agreed their skin appeared brighter after using this mask. The formula combines Spanish clay with Sweet Almond Oil to help nourish the skin. A BioNymph Peptide Complex promotes collagen production and elasticity of the skin. Frangipani Flower extract has moisturizing benefits and a delicate, sweet floral fragrance. Even though this mask has a large amount of clay in it the Sweet Almond Oil keeps it from drying out and keeps your skin from becoming dry too. It exfoliates the skin, detoxifies it and brightens the skin all in one sitting. All while moisturizing the skin and hydrating it too! It is amazing what this mask can do. I love it. You only need to apply a very thin layer, wait 10 minutes then rinse off with warm water and use a final splash of cool water to tighten the pores. Your skin will look amazing. I promise. The Goddess Skin Clay Mask retails for $55 for the 75mL size. It also comes in a 15mL size for $17.00. Like Charlotte Tilbury on Facebook: http://www.facebook.com/CTilburyMakeup; Follow Charlotte Tilbury on Twitter: @CTilburyMakeup; Follow Charlotte Tilbury on Pinterest: http://uk.pinterest.com/ctilburymakeup/; Follow Charlotte Tilbury on Instagram: http://instagram.com/ctilburymakeup; Subscribe to Charlotte Tilbury on YouTube: https://youtube.com/CTilburyMakeup and Follow Charlotte Tilbury on Weibo: http://weibo.com/charlottetilbury?is_hot=1.